I like parties, don’t you? And it is so convenient when there is actually a reason to throw a party, instead of having to invent something. So, how wonderful it is that I have a big reason to throw a party some afternoon around November 7 to celebrate the publication of my first book ever, Growing Up With G.I. Joe’s! I am thinking I would like to have an afternoon open house somewhere in the Portland area. I could present a little program on G.I. Joe’s, my dad ,and my growing up in Portland in the mid-20th century (gosh, that sounds like a long time ago, but it seems like yesterday). Then, I can sign some books, and everyone can visit with each other about back then and what is still very relevant about those times today, and I can think of a lot of things! Does anyone have any suggestions on where we could have the party? I am thinking a free place would be best, but if there is a little cost for it, that is OK. And, should I have one party, centrally located, or 2 – one for the east side and one for the west side? If you have any thoughts on this, please comment. If you want to send an idea for party location just to me, please email growingupwithgijoes22@gmail.com. Thank you…I am looking forward to it already! 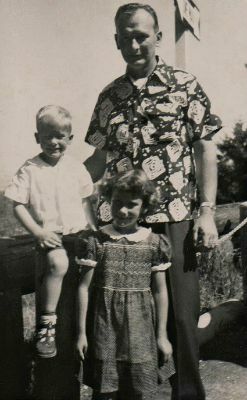 Photo of Dad, David and me was taken at the Portland Zoo when it was located at Washington Park, circa 1950. To bad Mom is not in it, but she took most of the photos. This entry was posted in Uncategorized and tagged Book Launch Party. Bookmark the permalink. 1 Response to Let’s Party in November for the Book Launch! I think one party is fine. How about a restaurant which has a separate room for groups? Wish I knew of any, but maybe someone does.